A wonderful combination of scenery, history and nature make this one of our most popular sightseeing tours. 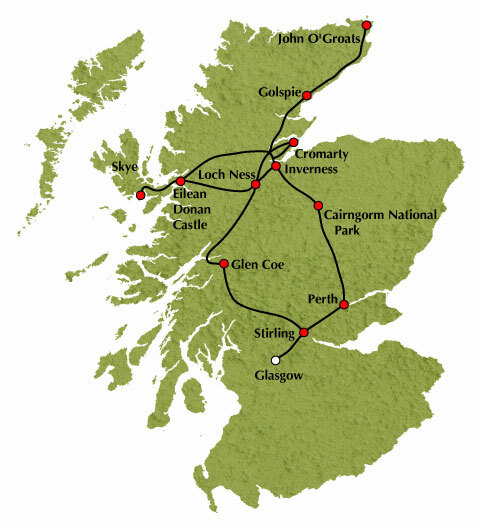 This tour provides the perfect introduction to the beauty of Scotland. Explore the stunning diversity of Scotland’s landscapes, from west to north, from hills and glens to lochs and coasts. From Glasgow we make our way to the sprawling wilderness of Rannoch Moor, and pause for reflection in the dramatic surroundings of brooding Glen Coe. We cross the Ballachulish Bridge to Fort William, against the backdrop of Ben Nevis. The spectacular Great Glen reveals its majestic beauty is next as we encounter first Loch Lochy, then Loch Oich and finally the entire length of mysterious Loch Ness. We take a break here so you can visit Urquhart Castle and take a ‘monster-spotting’ cruise *. We then continue to Inverness, the ‘Capital of the Highlands’ and our home for the next three nights. Your stay in Invernessis unescorted, so you can enjoy your time here as you please. Today’s full-day excursion takes you to the beautiful island of Skye. We travel through Glen Shiel, passing the Five Sisters mountain range. One of the most iconic images of Scotland is romantic Eilean Donan Castle, on an island at the head of Loch Duich. We make a stop here so you can visit and enjoy the views from this most photographed of castles *. Then, as the song goes, it's "over the sea to Skye” by way of the road bridge. After a stop for lunch, we follow the scenic route with wonderful views of the striking Cuillin Hills all the way to Portree, the island's main community. Why not take time out to visit the picturesque harbour with it's colourfully painted houses? Back on the mainland, we make our way to the village of Kyle of Lochalsh, then through pretty Glen Carron to Achnasheen before a short return drive to Inverness. We head north from Inverness across the Black Isle to the Cromarty Firth where we may see some seals, as the tides allow. Our first stop is in Golspie, where a 27m (90’) statue of the first Duke of Sutherland stands high above the town. The duke’s agents were involved in the most notorious of the 19th-century Highland Clearances. Our next stop is in John O’ Groats, the most northerly point of the British mainland, with time for pictures to capture your "I was here!” moment. We next make our way to Duncansby Head for an easy stroll along the cliff-top path for dramatic views of sea stacks and seascapes, as well as sightings of local birdlife such as guillemots, kittiwakes and, of course, those cheeky puffins (until late July). Take advantage of the binoculars available on our mini-coach for a close-up view. We make our way southwards from Duncansby through Wick, with a comfort stop along the way, to return to Inverness for the night. Our day starts with a short drive to the Black Isle, with beautiful views over the Cromarty Firth, as we travel to the fishing village of Cromarty . Our first stop at Chanonry Point provides an excellent spot from which to catch sight of the dolphins that live in the Moray Firth. The attractive town of Beauly is our next destination. Beauly was named by the 13th century monks who built a priory here, taking the name from the French for ‘beautiful place’ (beau lieu). We also stop at the popular Loch Ness Exhibition and Centre * before you rejoin your coach to head south into the spectacular Cairngorm National Park and the Spey Valley, with its outstanding views of the Cairngorm Mountains. We travel through the dramatic scenery of the Drumochter Pass towards Glen Garry; look out for impressive Blair Castle on the way. We pause for afternoon tea before continuing through the rolling Perthshire bound for Glasgow and journey's end. Tour Highlights: Rannoch Moor, Glen Coe, Fort William, The Great Glen, Loch Ness, Inverness, Glen Carron, Isle of Skye, Portree, dolphin-spotting, pre-historic sites, Cuillin Hills, Eilean Donan Castle, Five Sisters, John O'Groats, Duncansby Head, Wick, Beauly, Cromarty, Spey Valley and Perthshire. A child discount of £20 applies to children aged 3 to 15 years inclusive. We’re really sorry but children aged under 3 years cannot travel on this tour. Photo-ID may be requested to confirm discount entitlement.